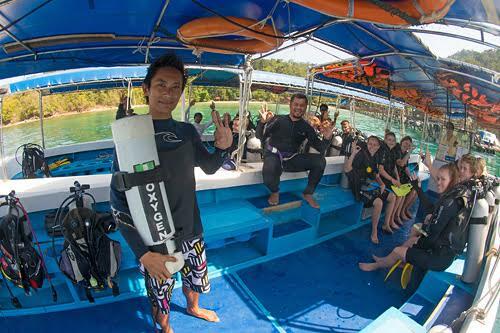 On Whats Going on at Downbelow Adventures ! Lying astride the equator, Borneo – the third largest island in the world is mostly covered by tropical rainforest. Mountain ranges and long navigable rivers flows across the island with hot and humid climate year round, makes Borneo a haven for a multitude of unique and endemic flora and fauna. The Borneo Big Five consist of Borneo’s most novel and exceptional wildlife. Sabah, Malaysian Borneo is home to some of the most iconic wildlife in the island. The Borneo Big Five are Orang Utan, Proboscis Monkey, Pygmy Elephant, Rhinoceros Hornbill and Estuarine Crocodile. A visit to Sabah would definitely be incomplete without a visit to some of the hotspots for the Borneo Big Five encounters! Number one on the list is the Orang Utan. 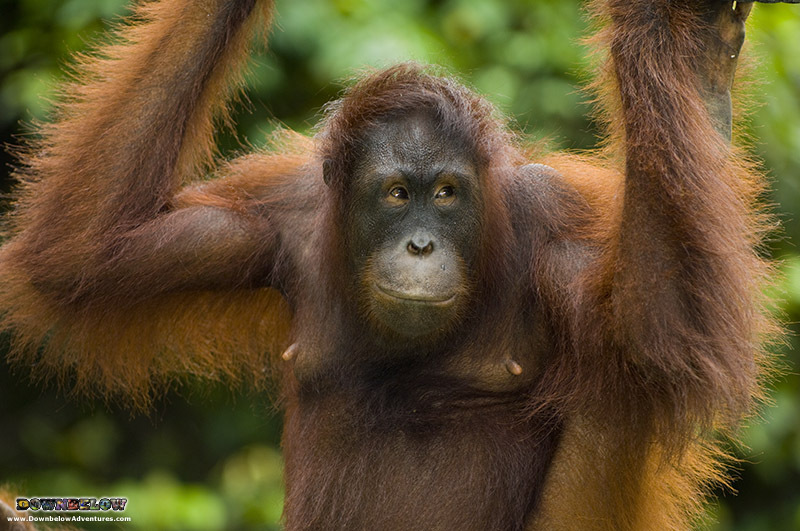 Orang Utan needs no introduction, they are extremely intelligent and distinctively different from other great apes. Orang Utan has a bright orange-reddish fur and likes to be solitary. A female can care for its offspring for up to 6 years. Deforestation caused the Orang Utans to be critically endangered, hopefully all the efforts from the authorities and NGOs in the country can put a stop to the species’ decline. Wild Orang Utan can still be safely encountered in several eco-lodges in Sabah including Borneo Rainforest Lodge, Danum Valley. Proboscis Monkey is one of the most unique animal in the world, the male have a huge pendulous nose and large pot belly. Highly arboreal, their long tails help them to maneuver long jump from tree to tree. 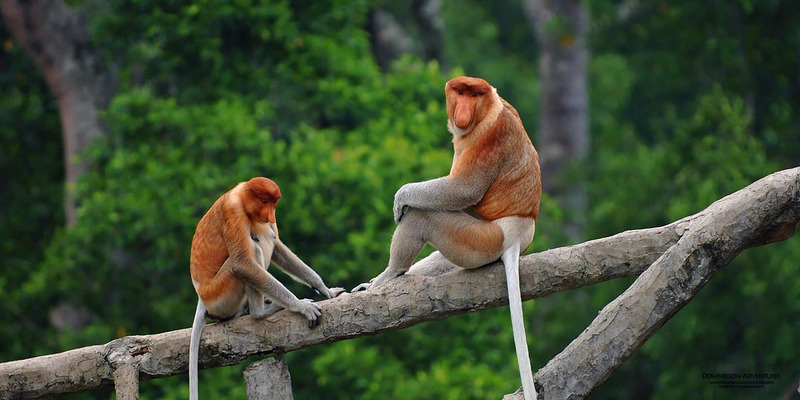 The Proboscis Monkey is so unique to Sabah, that they have become a mascot to represent Sabah. Its pot belly is thanks to its chambered stomach, which is useful to digest young leaves and unripe fruits that are inedible to other mammals. The Proboscis Monkeys are also excellent swimmers, so don’t be surprised if you see these natural acrobats crossing the rivers next time you go on a cruise to the Kinabatangan Rivers. 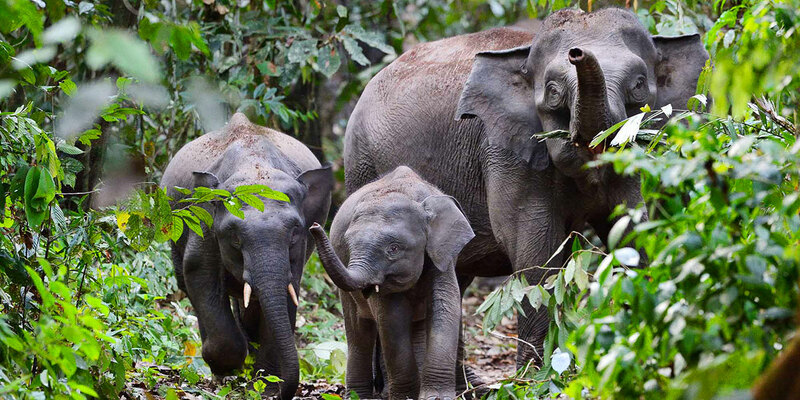 Pygmy elephant is the largest mammal in Borneo and also the smallest in elephant species. Their ears are proportioned larger compared to its head, making them the most adorable looking elephant in the world yet least understood among its bigger cousin. The pygmy elephant of Borneo is a high conservation priority, in fact most studies about this species are quite recent making them a very enigmatic creature of the forest. Nevertheless they are facing the same threat as many wildlife across the globe – illegal poaching due to more human encounters caused by their shrinking habitat. Now, a sustainable forest management could be the only answer to keeping the long time survival of the species. Next on the Borneo Big Five is the magnificent rhinoceros hornbill. The Dayak people or native people of Borneo revere this great bird as the supreme worldly bird. With wingspan reaching 1- 1.2 metre, and it’s very prominent large orange bill and casque one could hardly dispute its reign as the national bird for Malaysia and state bird for Sarawak. Motive of this bird is also common in traditional arts and handicrafts. The rhinoceros hornbill or Kenyalang is monogamous and mate for life, and usually comes back to the same tree for nesting. 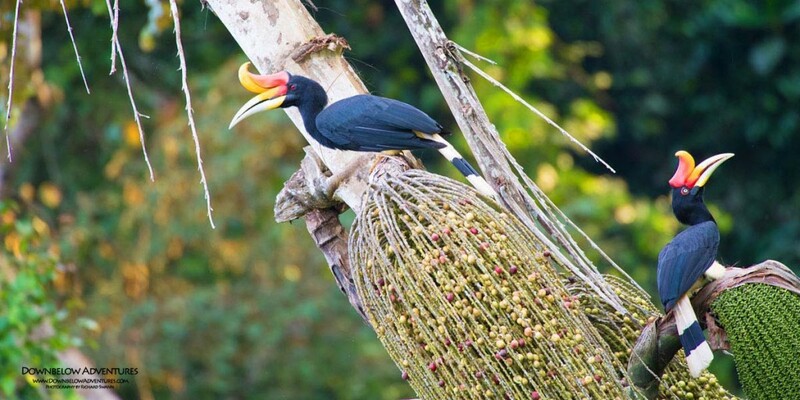 Though many have known that the female will stay sealed in a dark hole in a tree until the chicks hatch, many Dayaks also believe that if something happens to a female during nesting the male can die of heartbreak. Till now, the rhinoceros hornbill is still regarded as a symbol of good fortune and good omen to Bornean. Malaysia’s largest natural aviary located in Tabin Wildlife Reserve is the best place to encounter this great bird. Once as endangered species, the estuarine crocodiles have made a full come back in Sabah. 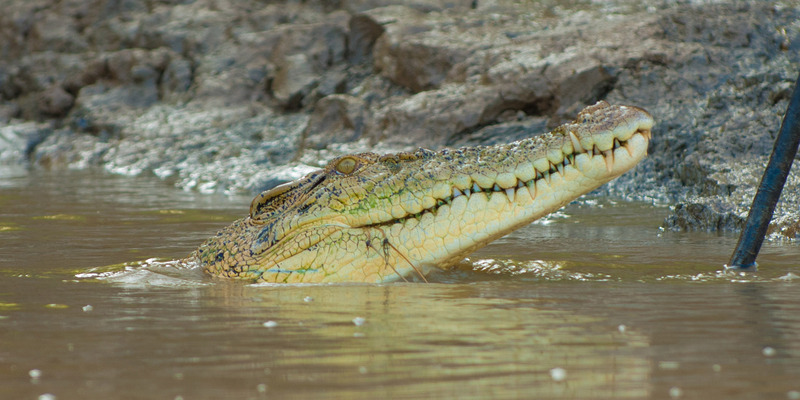 They are the largest crocodile to inhabit river estuaries including mangrove remote beaches. These living fossils are considered deadly, and are widely known to showcase their predator skills right after hatching. A common saying in Malay that translate as “ Don’t take a calm river for granted, as you don’t know the crocodile that lives in it”. They are a powerful predator and can kill their prey very swiftly with a strong force. Seeing the Borneo Big Five should be high on your list when visiting Borneo, grab the opportunity to encounter all five amazing wildlife in our Wildlife Adventure Program. Easy online booking available, but if you are looking for a bespoke travel experience our professional tour consultant will help you to tailor a personalized package that suits your preference and interest. To get in touch with our our Travel Centre team, contact us at +6012 866 1935 or email us at info@DownbelowAdventures.com. Book our wildlife programs here.